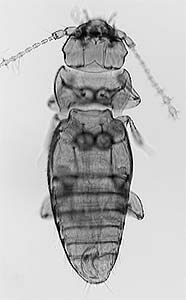 Certain genera of Ptiliidae posses species that exhibit forms of polymorphism (Dybas, 1978; Taylor 1981, 1980). The polymorphic states are generally divided into two categories: a 'normal morph' which possesses all the 'normal' characters composing featherwing beetle adult morphology, and 'vestigial morphs' that exhibit reduced or absent eyes and wings, shortened elytra, and absence of body coloration. At times the appearance of the two morphs varies so much that they may be mistaken for separate species. 'Normal' and 'vestigial' morphs are present in both sexes, and both forms occur at the same time within a population. Polymorphism is known within species of Ptinella, Pteryx and Ptinellodes. 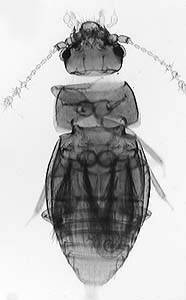 Taylor (1981) observed that polymorphism occurs in Ptinella aptera and P. errabunda seasonally in wild populations and was influenced by temperature in laboratory cultures, leading Taylor to conclude that "morph determination is based on a physiological switch sensitive to temperature and possibly other adaptively relevant environmental factors." Though both morphs produce offspring, Taylor notes "Ptinella alatae are reproductively superior to apterae." Above left: Pteryx sp., normal morph, exhibiting normal eyes, wings and coloration. Above right: Ptinella sp., vestigial morph, exhibiting reduced eyes, wings and color. Dybas, H.S. 1978b. Polymorphism in featherwing beetles, with a revision of the genus Ptinellodes (Coleoptera: Ptiliidae). Annals of the Entomological Society of America 71(5): 695-714. Taylor, V. 1980. Coexistence of two species of Ptinella Motschulsky (Coleoptera: Ptiliidae) and the significance of their adaptation to different temperature ranges. Ecological Entomology, 5: 397-411. Taylor, V. 1981. The adaptive and evolutionary significance of wing polymorphism and parthenogenesis in Ptinella Motschulsky (Coleoptera: Ptiliidae). Ecological Entomology, 6: 89-98. Page: Tree of Life Polymorphism in Ptiliidae Authored by W. Eugene Hall. The TEXT of this page is licensed under the Creative Commons Attribution-NonCommercial-ShareAlike License - Version 3.0. Note that images and other media featured on this page are each governed by their own license, and they may or may not be available for reuse. Click on an image or a media link to access the media data window, which provides the relevant licensing information. For the general terms and conditions of ToL material reuse and redistribution, please see the Tree of Life Copyright Policies.